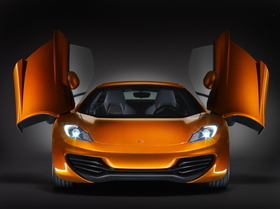 The McLaren MP4-12C has top speed in excess of 200 mph (320kph). The McLaren MP4-12C supercar will make its public debut at the inaugural Moving Motor Show in Goodwood, England, starting July 1. The event is being held to fill the gap left by the cancellation of the 2010 British auto show. Organizers decided in March 2009 to call off the biennial British show due to the global economic downturn. Three months ago, UK-based McLaren showed the media the MP4-12C, calling it the first of a range of supercars that will challenge Ferrari and Aston Martin. McLaren says the MP4-12C is likely to cost about 150,000 pounds ($229,200) and have an annual out of 1,000 cars when production starts in 2011. Models such as the new Audi A1, Alfa Romeo Giulietta, Nissan Juke and Volvo S60 will make their UK debuts at the Moving Motor Show. All four cars made their world premiers at the Geneva auto show in March. The Moving Motor Show is being held in conjunction with the annual Festival of Speed in Goodwood. The Festival of Speed gets started on July 2 and runs until July 4.